Sarah Cahill and Patterns of Plants showed up in the Classical Playlist on the New York Times ArtsBeat site today. Fittingly, Sarah's recording appears alongside a new release of works by Lou Harrison, whom composer Mamoru Fujieda cites as an influence and to whom he dedicated the first published edition of the Patterns. 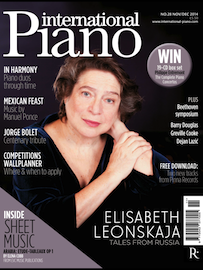 International Piano magazine is offering two tracks from recent Pinna releases (Eliane Lust's Entangoed and Sarah Cahill's recording of Mamoru Fujieda's Patterns of Plants) as free downloads! Details in the November/December issue. You can subscribe to the print or digital editions, and you can buy individual issues from the app on your iPhone or iPad.